What an unbelievable journey, with a great group of young men and coaches. What a great day to be a Viking! Augustana men’s basketball captured the 2016 NCAA Division II Men’s Basketball National Championship in front of just under 2,000 fans at Dr Pepper Arena in Frisco, Texas on Saturday afternoon, many of which were decked out in Navy & Gold. This was my first experience at the men’s Division II National Championship game, but I’d be willing to say that all of you Augustana fans created one of the most memorable atmosphere’s for a national championship game in quite some time. Kudos to each and every one of you for your support. To the fans, thank you so much. Your support in Frisco, Sioux Falls and around the world has been outstanding. Don’t think that your messages, notes and Tweets have gone unnoticed. We truly saw how great it is to be an Augustana Viking with your show of support for the men’s basketball team during this run. As I’m writing this, at 30,000 feet in the air and in the most comfortable plane I have ever been on, the actuality of what we just experienced hasn’t quite set in yet. A group of 14 young men, 14 of 1,800-plus students at Augustana University accomplished something they will never, and I mean never forget. Don’t think for a second that all of you didn’t have something to do with it. We received comments from the national basketball committee, and the great people of Frisco about how great the Augustana fans were and how happy they were to have all of us in their city to take part in this event. To the senior class, thanks for the ride. Back-to-back conference champions, back-to-back tournament champions, region champs and now national champs. I know I don’t need to remind everyone of all the accomplishments of this group. Three national tournament appearances in four years is quite the impressive run, especially how it ended this year. Over 6,000 career points, and 2,000 career rebounds will graduate this year. That’s quite a special group. Following the on-court ceremony, the celebration carried over into the team hotel with hundreds, and I mean hundreds of Augustana fans filling the hotel restaurant to share in the excitement together. Upon finishing up my work at the arena, it was quite the sight to see and hear all of the fans’ excitement over this team. Fight on for Augustana even broke out in the hotel and could be heard from eight floors up as I was packing my bags. The team was able to enjoy the championship with friends and family on the court and at the hotel before loading the bus at 6:30 p.m. to head to the airport. We had the luxury of getting a chartered flight out of Dallas and were set up with a nice two hour and five minute flight home. By the time you read this, we all will have arrived home safely and gone our separate ways for the night but none of us will ever forget what we just experienced. I hope you all have enjoyed the coverage of this remarkable journey to the Elite Eight. I would like to thank others that also shared our experiences with you and everyone back home. Thank you to Nate Burdine and Jolene Loetscher from MudMile. All of the great videos you put together for fans were a great addition to our trip and will be cherished forever. I would also like to thank Mark Ovenden and Nick Huntimer from KDLT, Travis Fossing from KELO, Elliot Nathan and Jordan Born from KSFY, Ian Frazer with the Argus Leader and David Brown from Midco Sports Network for all of your hard work to keep all of our fans and everyone in South Dakota and around the world up-to-date with great reports from Frisco. I don’t know if any of you picked up on my superstitions throughout the coverage, but I’m going to let you in on a little secret. Adam Beyer proved to be lucky as the featured photo on GoAugie.com for pregame stories as did Alex Richter on pregame graphics. I’d also like to throw a little #NerdStat your direction. My suit rotation in postseason play ended up with a perfect 9-0 record. I wore the same suit combination for the quarterfinals of the NSIC Tournament, the regional tournament and the national championships (don’t get any ideas, I had them all dry cleaned in between). In the quarters, it was the grey sport coat, blue and white striped shirt (no tie, four games is a long day to wear a tie), blue dress pants and cowboy boots. Semifinals; black suit, black shoes, blue shirt with blue/silver/black tie. Finals: grey sport coat, white shirt, light blue tie. I’m not superstitious at all am I? One last thought, if you'd like to look back on social media reaction of the entire trip to the Elite Eight, check out #AugieMadness on Twitter. Thanks again for following and as always, Go Vikings! Well another busy day is in the books, and what a week it has been. Here we are on the eve of the National Championship game. What a ride it has been and we get to put it all on the line in front of millions of people on national television. It has been a pleasure to work with the great people at CBS to help them get ready for tomorrow's broadcast. Speaking of which, that's how the day started out. We met with CBS producers this morning for some pre and in-game graphics for tomorrow's broadcast this morning. Watch all the videos from this past week HERE. After the taping of the video above, Daniel Jansen took a shot at interviewing teammate Casey Schilling. Look for that video on our social media outlets Saturday morning. With that, I wish you good night, and a happy national championship game eve. Whether you're here with us in Frisco, or back home in Sioux Falls, or anywhere around the world, cheer loud and Go Vikings! Your Augustana Vikings are headed to the National Championship game! The Vikings put on a stifling defensive effort last night in a 74-55 win over Western Oregon to advance to the national title game. Post game press conference from last night's game. Today will be a busy day. Look for posts on my Twitter account (@EvansT99) as the team will have some photo shoots with CBS. We'll also have some time with Westwood One Radio this afternoon. Coach Billeter will have a press conference at 12:45 and the team will practice at 1:30. Following practice we'll meet with local media and then the rest of the day is open. First of all, thank you for your patience. I would have loved to put a blog post together about what we all saw happen last night here in Frisco, Texas, but my head didn't hit the pillow until about 3 this morning. Talk about an unbelievable team effort. For much of the game it seemed as if every time the Vikings would answer and cut into the lead, Tarleton State would hit a big three or get a few quick baskets. The boys never quit. With that being said, following last night's game, coach Billeter and myself met with the television crew from CBS to prepare for tonight's broadcast. If you have not heard as of yet, there will not be a web stream of tonight's game. The only way to watch is on CBS Sports Network. 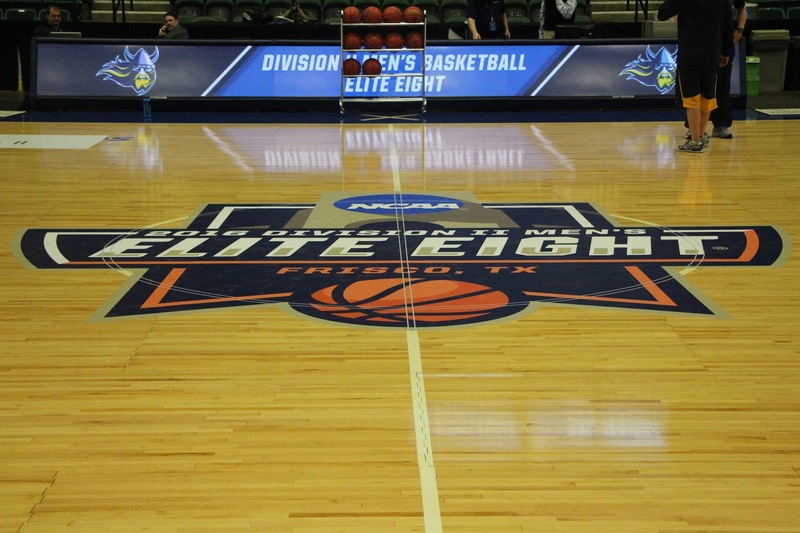 For a complete channel listing in the Sioux Falls Area, visit www.GoAugie.com/elite8. If you do not get CBS Sports Network at home, multiple locations in Sioux Falls will carry tonight's game. For a complete list of restaurants that will have the game on TV, click HERE. As I mentioned earlier, following the post game press conference last night, coach Billeter and myself visited with the producers and on-air talent from CBS. If you have not seen yet, we have been putting together short videos throughout the trip here in Frisco. A big thanks to MudMile for these. To view the videos, click HERE. Here is the game story from last night, click HERE. I was able to grab dinner about 10:30 last night after leaving Dr Pepper Arena then went straight back to the hotel to get things ready for the TV crews and GoAugie.com today. What a busy day it has been. The team started out the morning with breakfast at the hotel before loading up the bus to head to Sonntag Elementary School in McKinney, Texas for its community outreach portion of the trip. The Vikings visited with students in grades 3-5 and talked to them about the importance of education, exercise and hard work. Coach Billeter started the morning by getting the kids fired up to cheer for the Vikings. After arriving at the school, the students at Sonntag made a tunnel outside of the school for the guys to walk into the school to loud cheers. The students and teachers at Sonntag Elementary were very welcoming and appreciative of our visit to their school. The guys stuck around and signed autographs for students in selected classes and had a group picture taken. Following the visit to Sonntag Elementary, the team went over to Reedy High School to shoot around and get ready for tomorrow's game. After lunch and a brief break, head coach Tom Billeter joined the other seven head coaches of the teams in the Elite Eight for the pre-tournament press conference. Players met with the Sioux Falls media that made the trip down to Frisco before Friday's practice. Travis Fossing from KELO-TV and Elliot Nathan from KSFY-TV were able to make it down for the press conference and team practice. Here are a few photos from today's practice session at Dr Pepper Arena. Today was full of activities but now we get to the reason we're here. Tomorrow is Gameday! I'm going to leave you with this for the night as I am off to put the finishing touches on my softball recap from today's NSIC opener at Wayne State. I hope you are enjoying the blog and also make sure to follow along on Twitter (@GoAugie and @EvansT99) for updates throughout the trip. 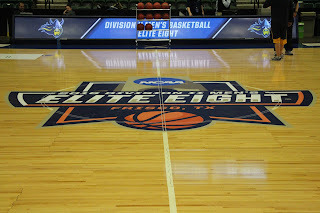 Make sure to visit www.GoAugie.com/elite8 for all your links for live coverage of tomorrow night's game. The game will be streamed live on NCAA.com at 6 p.m. (CT). The team had a short time to get situated in the hotel after our arrival in Frisco before loading the bus back up to head to the Elite Eight Opening Reception. The reception was held at the Main Event (think Dave and Busters) in Frisco. As teams arrived to the Main Event, they were announced one-by-one upon entering the building. We were treated to a Texas Barbecue buffet that was highlighted by smoked ribs, brisket, chicken and smoked sausage. After enjoying the meal teams were able to spend some time in the arcade before the main event got underway. The event featured a friendly circuit of games that pit the eight teams against one another in arcade free throw shooting, billiards, and bowling. We let the seniors decide who would participate in each event. Only the top four teams from free throw shooting moved on to billiards, and the two remaining top teams from billiards went head-to-head in bowling. Casey Schilling and Tanner Odegaard led the Vikings to a first-place finish after the free throw shooting portion. Zach Huisken, John Warren, Ben Weisbeck, Austin Saugstad and Dan Jansen sealed the victory over Tarleton State in Bowling to take home the Great Texas BBQ Bowl Championship Trophy. The boys have an early morning on Tuesday and will start the day with community outreach visiting a local elementary school. The pre-tournament coaches press conference is scheduled for 2 p.m. (look for coverage on GoAugie.com) and the team will have practice at Dr Pepper Arena from 4-4:55 p.m. The team left Sioux Falls at 9:30 this morning and took off for Denver International Airport. It took just over an hour to get to Denver so now we'll sit at the airport until our 12:45 (MT) departure from Denver. We had a great view of two of our favorite venues in Sioux Falls on our way out of town. At runway speed, the Sanford Pentagon and from the air, the Sioux Falls Arena. We had a great view of the Rocky Mountains on our way into Denver and we also have a shot of the crew loading our bags for our connecting flight. Upon our arrival in Dallas we'll grab our bags and catch our team bus and get checked into the hotel. The pre-tournament banquet is tonight so keep an eye on Twitter (@EvansT99 and @AugieMensBball) for updates on our evening activities. I'll have another update tonight and throughout our trip to Frisco. Welcome to the 2016 Elite Eight blog!